American officials say Revolutionary Guard expected to begin major exercise to demonstrate ability to shut down the Strait of Hormuz. Iran's Revolutionary Guard (IRGC) forces are expected to begin a major exercise in the Persian Gulf as soon as within the next 48 hours that could be aimed at demonstrating their ability to shut down the Strait of Hormuz, two U.S. officials familiar with the latest assessment of IRGC troop movements told CNN on Wednesday. "We are aware of the increase in Iranian naval operations within the Arabian Gulf, Strait of Hormuz and Gulf of Oman. We are monitoring it closely, and will continue to work with our partners to ensure freedom of navigation and free flow of commerce in international waterways," Captain William Urban, chief spokesman for U.S. Central Command, told CNN. 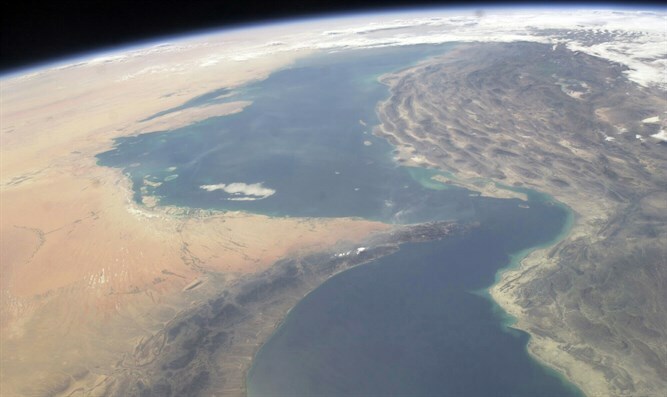 The Strait of Hormuz is a strategically critical passageway linking the Persian Gulf to the Arabian Sea that is crucial to international shipping and particularly for global energy supplies. Iran has threatened more than once to close the Strait of Hormuz, with the United States warning Iran in response that any attempt to close the strait would be viewed as a "red line" -- grounds for U.S. military action. The latest such threat came last month, when the IRGC warned it could block the Strait of Hormuz in the Gulf should the U.S. prevents its oil exports. While the U.S. sees no immediate signs of hostile intent from Iran, the IRGC show of force has U.S. military intelligence deeply concerned for three fundamental reasons, CNN reported. The reasons are: The exercise comes as rhetoric from the IRGC towards the US has accelerated in recent days; it appears the IRGC is ramping up for a larger exercise this year than similar efforts in the past; and the timing is unusual as these types of IRGC exercises typically happen much later in the year. There is "major concern" because of these factors, one official said. As of now, according to CNN, the U.S. assesses the IRGC has assembled a fleet of more than 100 boats, many of them small fast moving vessels. It's expected Iranian air and ground assets including coastal defensive missile batteries could be involved. Hundreds of Iranian troops are expected to participate and some regular Iranian forces could be involved as well. The IRGC exercise comes as the U.S. has only one major warship, the USS The Sullivans, inside the Persian Gulf, several officials said. Other American warships are nearby and there are numerous combat aircraft in the region. The tension follows President Donald Trump’s withdrawal from the 2015 deal, under which sanctions on Iran were lifted in return for curbs to its nuclear program.